Las Vegas, Nevada – January 7, 2014 – Speck, the leading designer of award-winning, slim-fitting protective cases today announced at the Consumer Electronics Show (CES) two new cases for smartphones and tablets, CandyShell Inked for iPhone 5s and DuraFolio for iPad Air and iPad mini/mini with Retina display. Both are skillfully designed for style, while also guaranteeing military grade protection in a slim-profile case. CandyShell Inked is Speck’s legendary CandyShell case now wrapped with high-resolution graphics in vibrant colors, for a bold new Speck look that guarantees military-grade protection. The printing process that our CandyShell Inked cases undergo uses an incredibly high print quality to achieve sharp graphics and brilliant colors resulting in a durable coating that resists scratches. The CandyShell has patented dual-layer casing in a single-piece construction that combines a hard outer shell which guards against impact, and a soft inner layer, which absorbs shock. Additionally, a raised bezel around the perimeter of the phone protects the screen from impact. The ultra protective DuraFolio is an innovation on Speck’s award winning folio case design for tablets. It is Speck’s most protective tablet case with an innovative dual-layer design that delivers unsurpassed impact protection harnessed into a slim, functional, and versatile folio. Unlike other protective iPad cases, DuraFolio only adds a slight .3” depth to the device and its sleek, mighty construction is reinforced with a hard polycarbonate inlay and textured, grid finish for better grip. The impact absorbing, dual-layer construction combines a hard shell exterior and a soft, cushiony interior to enable more sophisticated style and strong protection. It is fully adjustable for a range of typing or viewing positions, and a magnetic closure works with the iPad’s sleep/wake function to turn it on and off automatically. 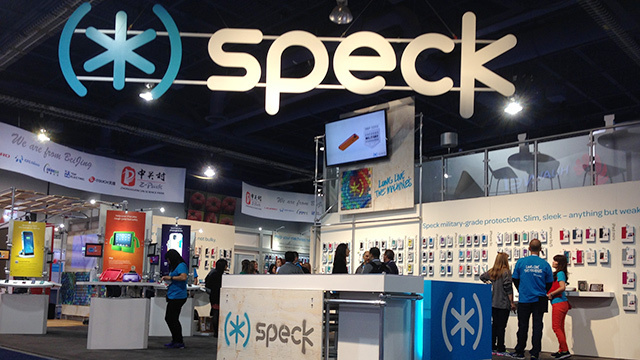 Speck’s new cases and the entire 2014 lineup, is at booth #30432 in the South of the LVCC. And we’re obsessed with creating a more perfect union between humans and machines. That’s why we design award-winning, proven-protective cases for mobile devices, including smartphones, tablets and MacBooks that are bold, not bulky. That’s why we insist on designing every case in-house and lab testing down to the details, often against rigorous military-grade standards. And that’s why we hold patents on functional innovations that enhance the relationship between you and your devices—all without sacrificing protection or style. Since 2001, Speck has created cases with sleek lines, radiant colors, and military-grade protection that make your device live longer: LONG LIVE THE MACHINES™. Get to know us at speckproducts.com or follow us on Twitter, Facebook, Instagram, and Pinterest.